If an accident is the result of negligence, you may be able to file a personal injury suit. If you, a friend, or a family member, have been injured on account of someone else’s negligence you are likely entitled to compensation. While we cannot stop the pain and inconvenience this may have caused, we can help you move forward and focus on your recovery. At Umbrella Law, our experienced team of personal injury lawyers in Edmonton will help you make sense of everything and determine whether you have a claim. We’ll be there by your side and will guide you step-by-step through this process. We understand that you need someone that understands what you’re going through while working relentlessly to achieve the compensation you deserve. We Get Tough. You Get Results. Injured in a motor vehicle accident? Don’t settle your claim without an experienced injury lawyer at Umbrella Law. We will help you with your claim and seek rightful compensation. Our accident and injury lawyers in Edmonton will aid injured vehicle crash victims get the compensation they deserve, for pain and suffering, loss of income, cost of care and other out of pocket expenses. If you’re the victim of a slip and fall accident because of negligence you may be entitled to compensation for general damages, pain and suffering, and any out-of-pocket expenses or future medical costs. If you or someone you love has been bitten by an animal, Umbrella’s Personal Injury Lawyers are here for you. We’re committed to helping you obtain the compensation you are owed under Alberta’s law. We are committed to helping seriously injured individuals get the fair compensation and access to the resources they need and are entitled to in order to recover from their injuries. Senseless death is devastating and loved ones cannot be replaced, but an aggressive lawsuit may right wrongs, help family and friends find closure and at the very least it may save others from similar tragedy. Injuries sustained from motorcycle accidents can be devastating. If you or someone you love has been affected by this type of crash, our experienced team of lawyers is here to help you seek justice. Defetive and dangerous products can cause serious harm to all users. Don’t suffer the financial burdens of manufacturer negligence, Umbrella Personal Injury Law will ensure you receive the compensation you deserve. If you or someone you love has been injured and is in need of a personal injury lawyer, Umbrella Injury Law is here for you. Our experienced legal team works hard for our client to earn them the settlement they deserve. If you’ve been a victim of an injury, don’t suffer in pain. Reach out today for a consultation. 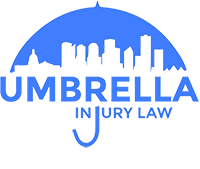 Copyright © 2018 Umbrella Injury Law Edmonton, Alberta.